Introducing PSAA’s newest mural, Sow Radical Seeds, at the Montavilla Farmers Market (7700 SE Stark St). 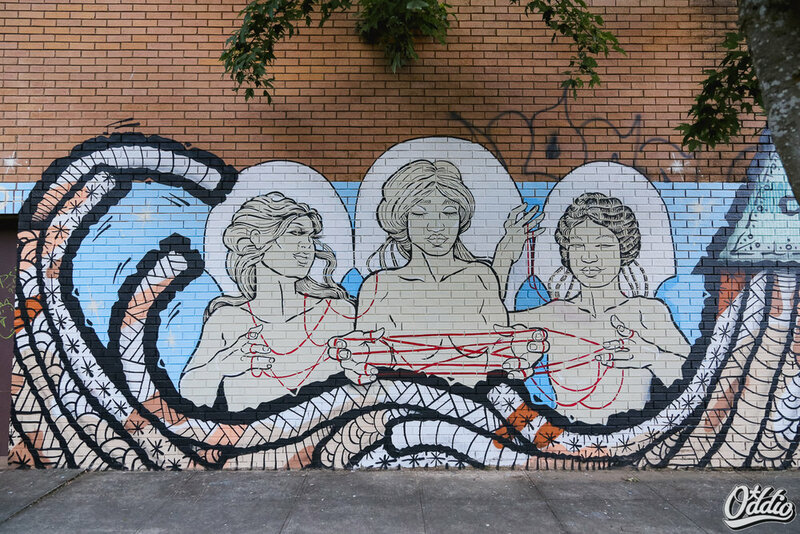 This mural was designed and painted by an all-female team of artists: Girl Mobb, Sara Eileen, and Portland's own N.O. Bonzo. It depicts two strong women, sowing the seeds of radical community-driven change, nurturing a more sustainable world where communities have food security, food sovereignty, and equitable access to healthy nutritious foods. It took the artists only 3 days to complete the mural. It is the perfect backdrop to the weekly farmer’s market! PSAA has been working with Montavilla neighborhood residents and hoping to secure more walls for art in the near future. The mural came into existence thanks to efforts by the Montavilla Neighborhood Association and PSAA. Working together in just one week they secured partial funding, an artist team, and a mural permit. PSAA, the Montavilla Neighborhood Association, and Montavilla Farmers Market officially introduced the mural to the neighborhood by hosting a community meeting where artists, organizers, and farmers came together to talk about how they sow radical seeds in the community with the work they do. At the meeting, Javier Lara of Anahuac Produce spoke about his work as a farmer, community leader and activist for human rights. His philosophy on farming stems from a deep connection to nature, and his practice mimics those beliefs. Javier says farming is “more than just local or organic, it has to do with community, and human beings are part of this system.” Javier also fights for farmworkers’ rights as well by working in partnership with PCUN-Pineros y Campesinos Unidos del Noroeste (Northwest Treeplanters and Farmworkers United). PCUN is Oregon’s farmworkers union and the largest Latino organization in the state. Lily Matlock of Lil' Starts also spoke at the meeting about her 2-acre urban farm located in the East Columbia neighborhood of NE Portland. Lil’ Starts uses permaculture and biodynamic principles to grow clean, healthy produce and robust productive plant starts for local farmers markets, restaurants, and their two CSA programs. This mural and community meeting was an opportunity to meet people who are sowing radical seeds in Montavilla, and soak up some inspiration for your own community good works! 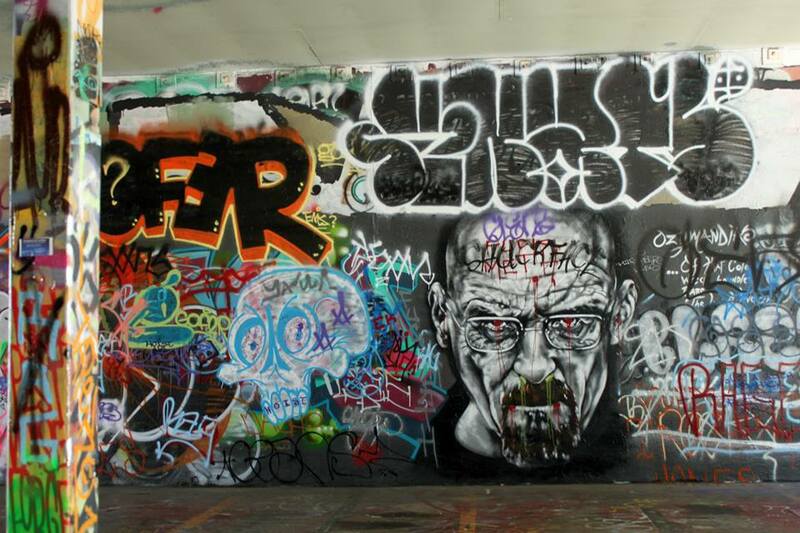 A brief overview of several rotating graffiti art walls in the U.S. The City of Tacoma partnered with a private property owner to transform an open-air parking garage in downtown into a free space for graffiti. Paint was only permitted on Sundays only. This program was done in partnership with the City of Tacoma and its impact was tracked by the city. 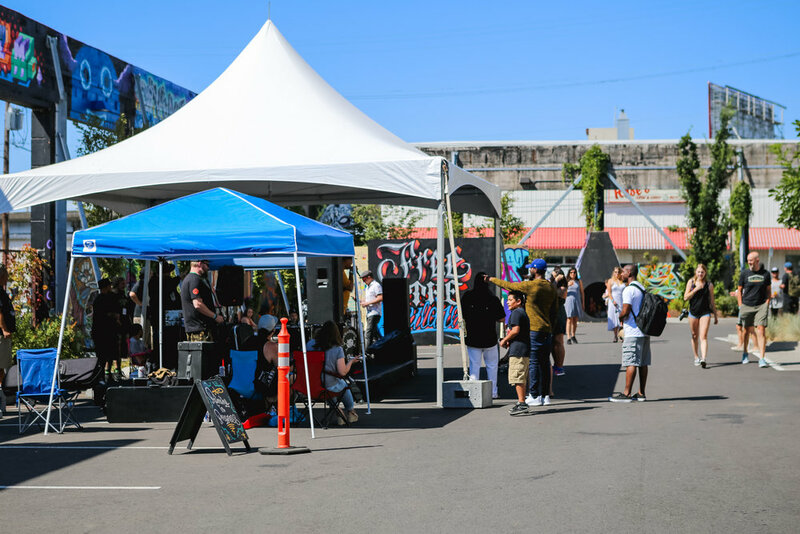 The city aimed to: 1) connect with artists who would not necessarily apply for a permit or grant and 2) provide a safe space for people to paint in public. In their research, the city found that graffiti in the immediate vicinity increased slightly, but the overall amount of graffiti found in the city reduced. The free wall in essence concentrated graffiti into a centralized space. The graffiti garages became a community gathering space, tourist attraction, and populate film and video shoot location. A few complaints were received early on, but pushback eventually subsided. 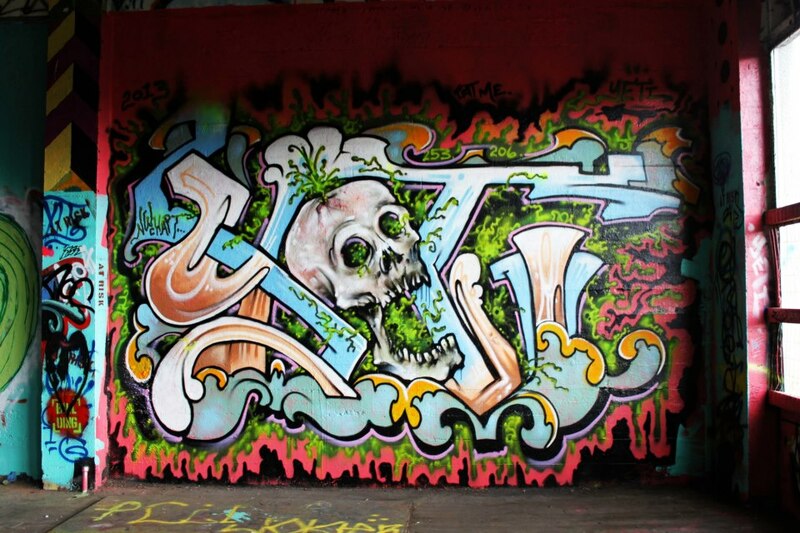 Eventually in late 2013, the garage owner chose to stop allowing graffiti at the site citing safety and overuse as the cause for their decision. The Community Chalkboard + Podium is an interactive, democratic, and uncensored monument to the first amendment, offering the public a venue to practice of the right to free expression. The chalkboard is 60’ by 7’ high, and made of slate. It is located directly in front of Charlottesville City Hall and is part of an area known as First Amendment Plaza. Due to the low barrier medium, a wide array of people interact with this wall on a daily basis. This project joins educators, artists, and designers with local youth to explore and interpret the places where they live. It acts as a public discussion board for a variety of discourse including political, social and global issues. It has received an Urban Excellence Silver Medal in the Bruner Award Program. The Thomas Jefferson Center for the Protection of Free Expression manages the wall, and the design came from Architects Peter O'Shea Wilson and Robert Winstead. Cleaning and maintenance is done mostly by volunteers who live or work nearby, and it is cleaned at least twice a week since it is so popular. A long pedestrian tunnel under the railroad tracks at North Carolina State University has served as a public free wall since 1968, when it was first painted to celebrate returning veterans. Anyone is permitted to decorate the tunnel walls at any time. Campus clubs and organizations often paint the tunnel to promote events and graffiti artists use it as practice space. Since 2010 there has been an ongoing tradition of a weekly ‘freestyle cypher’ where local artists and students gather to freestyle, beat box, sign, play instruments, recite poetry and network. The tunnel has only had one documented issue come up, which occurred after President Obama was elected. Racist graffiti appeared with threats against Obama. 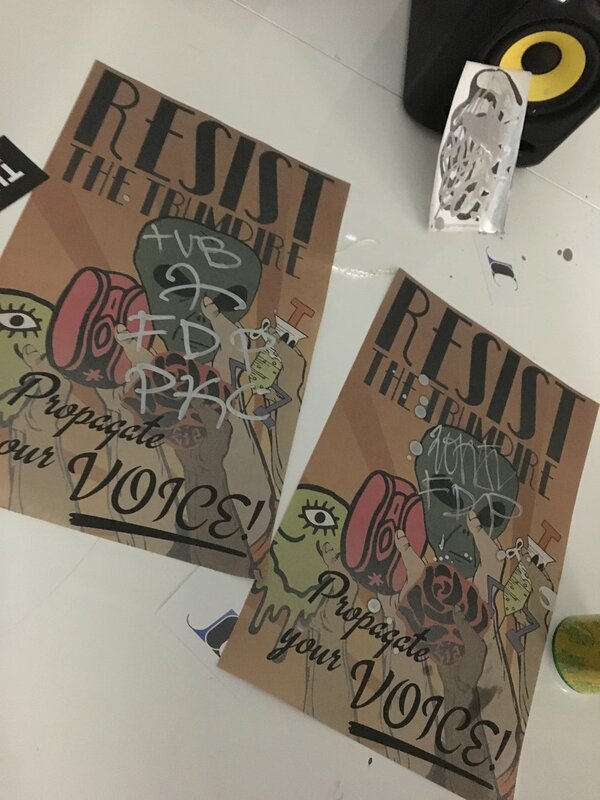 The U.S. Secret Service quickly identified the four students responsible for the hate graffiti and the students were expelled. For 7 years, the former 104-year old building known as TUBS sat vacant at the corner of 50th and Roosevelt in the University District, amidst a bustling urban neighborhood. 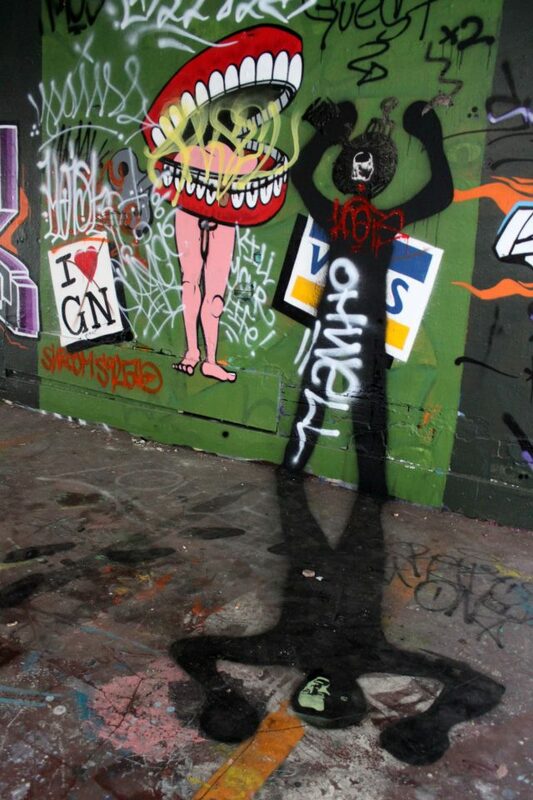 In 2009, the building owner thought it's demise was near, so they invited graffiti artists to use the 12,000-square-foot space as a canvas for their art and expression in the meantime. The owner wanting to provide the community an "ephemeral and evolving" piece of curated street art. Over time, the space opened up even more to other artists, and it essentially became a free wall - a hot spot for Seattle graffiti. 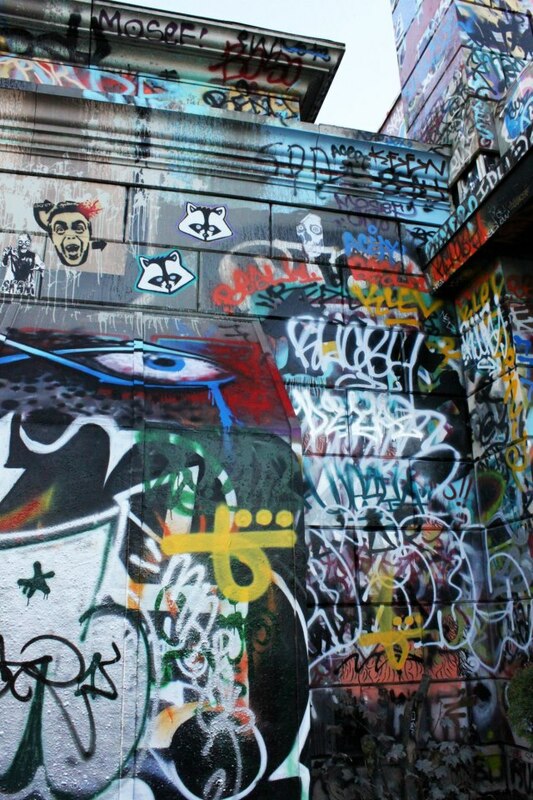 A year after the free wall began, the City had received over 900 graffiti complaints. But the building owner fought back, citing their private property rights and community appreciation for the art. By this point, TUBS had become a tourist destination and like many graffiti meccas, served as an urban backdrop for photographers and filmmakers. In response to the complaints, the City of Seattle said they're hands were tied and they had no power to force the owner to clean up their building. Seattle City Attorney Ed McKenna said, "Legally, we're in a difficult position. We can't force the owner to remove his graffiti, so we have pretty much have exhausted every remedy." 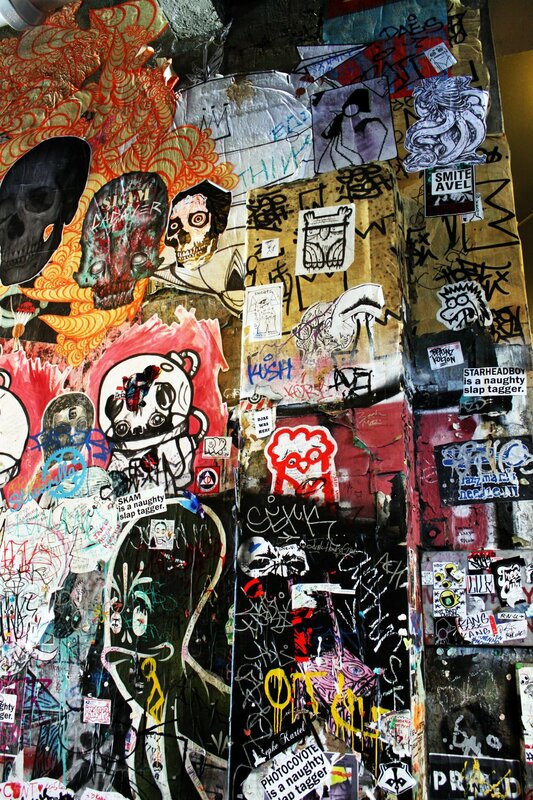 The City of Seattle defines graffiti as "unauthorized markings." The difference with TUBS was that the building owner willingly allowed their building to become a "free wall," so the City of Seattle could not fine or penalize them for graffiti. The free wall at TUBS continued for 6 more years until 2014 when it was finally demolished to make way for a large condo building. 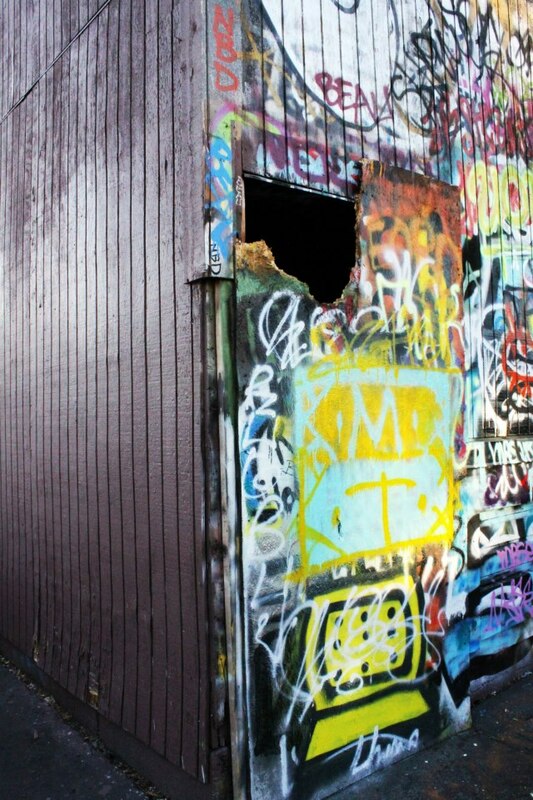 The TUBS free wall was an important piece of Seattle's urban art history and unique when it comes to other cities in the U.S. 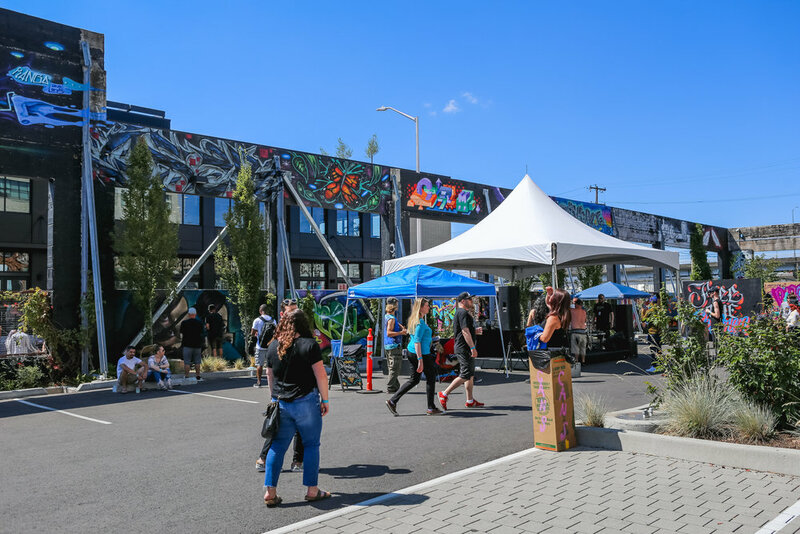 The owners of a warehouse building on Occidental Avenue across from the Starbucks Headquarters, in the SODO neighborhood of Seattle welcomed graffiti artists of all types to come create art on an over 100-foot wall that backs up to the train tracks. This was a non-formally managed project where artists have free reign, and the work changed often. Because the project was on private property and backs to an industrial area, there was minimal conflict with the larger community over the activity and content surrounding the project. This free wall is located on the backside of the State Theater, in downtown Olympia. It is part of a network of urban alleyways. The walls near the free wall are marked with warning signs to not paint here and are buffed regularly to control spill-over graffiti. This ‘community paint park’ is located in downtown Austin, TX. This educational project is managed by the non-profit HOPE Events and was launched in 2011 with the help of street artist Shepard Fairey. The paint park provides artists, arts education classes, and community groups the opportunity to display large-scale art pieces driven by inspirational, positive and educational messaging. The park has broadened based on the response from local families, community members and the Austin Creative Class. It has become an inspirational outlet and creative destination for all that come to visit and is recognized as one of the Top 10 Artistic destinations in Texas. The park has provided many benefits to the community including job creation for local artists, connections to art commissions, a site for school classes and field trips, live art projects, dance videos, breakdancing and urban agriculture classes. The HOPE Outdoor Gallery is located on private property. Anyone over 18 years old who wants to paint must register beforehand by emailing the coordinators. An adult must accompany any youth wishing to paint or visit. 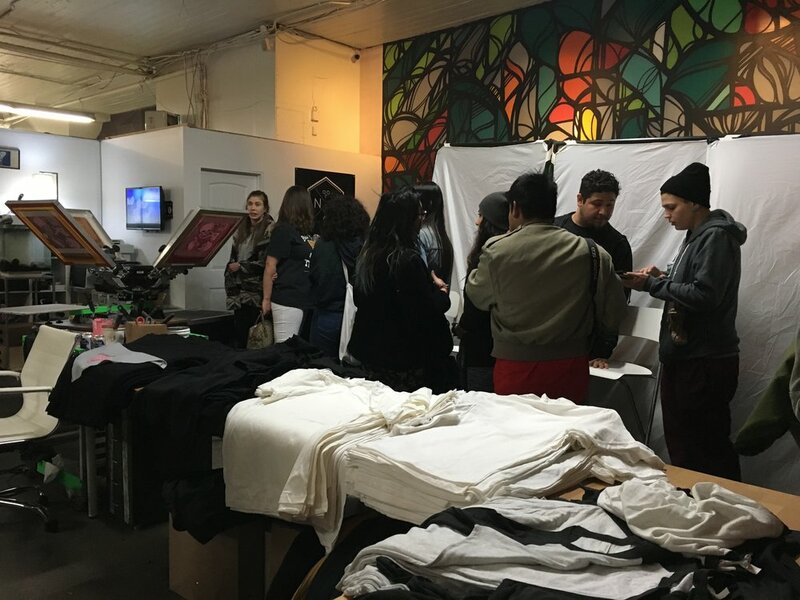 When registering, artists are asked to ﬁll out a question form, provide proof of ID, submit a sketch or mock-up of the art intended, and sign a waiver in order to receive credentials. The park is only open for painting between 9am and 7pm daily, and no one is allowed to paint after dark. Painting passes are available for pick-up on Saturdays and Sundays during designated hours. Painters without proper credentials (a painting pass) are asked to leave and may be subject to arrest for trespassing. All participants must respect the existing art, be courteous to the neighborhood and dispose of all your trash. In January of 2018 it was announced that the HOPE Outdoor Gallery is relocating and expanding with the creation of a new six-acre project launching at Carson Creek Ranch in southeast Austin. Starting in 1993, developer Jerry Wolkoff gave permission to a group of graffiti artists to decorate his building to try and deter vandalism in the area. 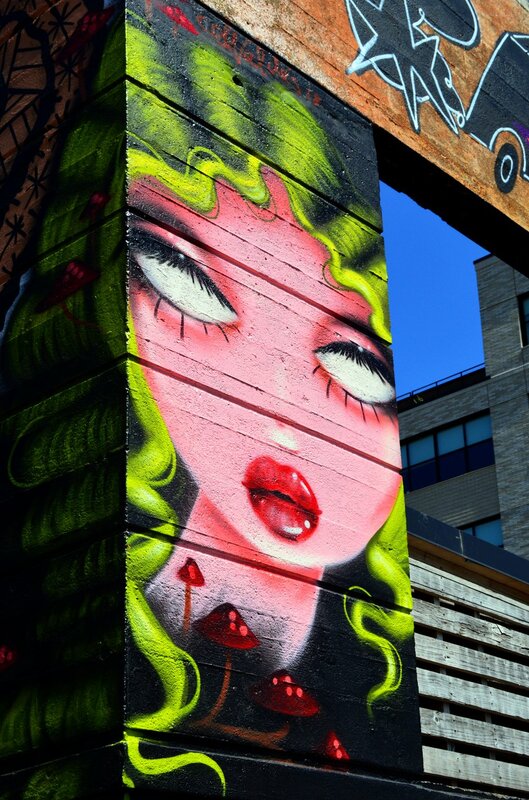 Over time, the building became covered in vibrant street art and the building was rented to artists as studio space. The space was managed as a rotating art wall and artists needed to arrange to paint ahead of time. It was a mecca for artists from all over the world to come and add to the murals. For over 20 years, the location was a tourist destination, and also helped Long Island City become the vibrant neighborhood it is now. The owner eventually tore down the building, and the site is now the subject of a federal court case filed by the artists who say the artwork itself was their property based on the Visual Artists Rights Act. (V.A.R.A). 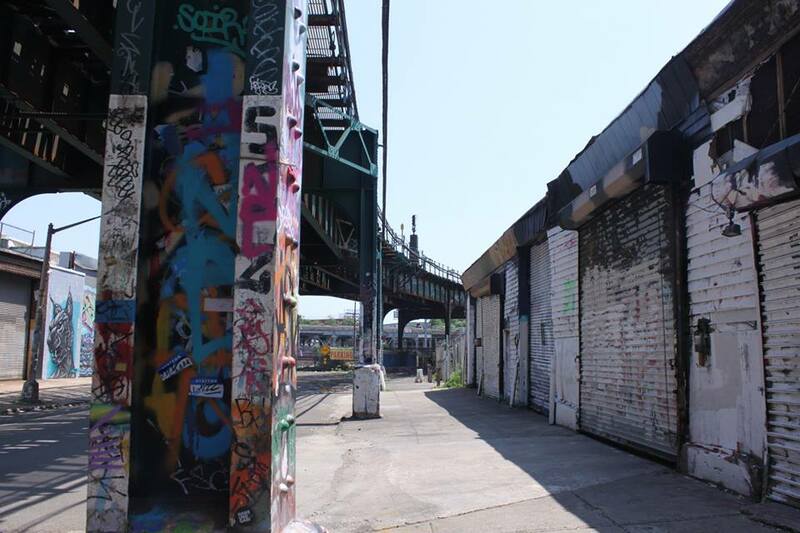 The photos below were taken in 2014 after the notorious buffing of 5Pointz by owner Jerry Wolkoff. Special thanks to PSAA Intern Erika Galt for help researching and editing this article. Graffiti abatement “zero-tolerance” laws in the U.S. are primarily based on an outdated and unproven (perhaps even disproven) theory commonly referred to as “The Broken Window Theory.” This theory was first outlined in 1982 by two researchers, James Q. Wilson and George L. Kelling. The premise was that a place which looked like it was not being taken care of, and had things like broken windows and trash in them sends messages to criminals that the space is not regulated or controlled. This appearance of neglect would then attract all sorts of violent and quality of life crimes, descending the area into chaos. 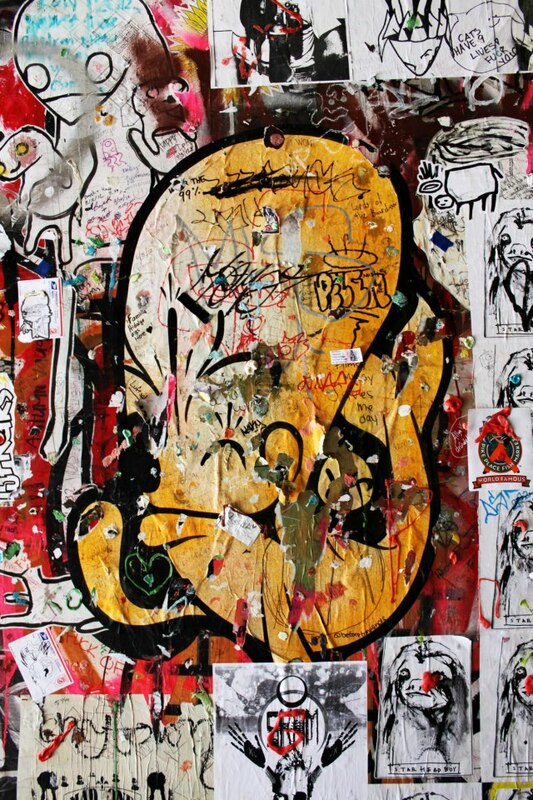 Even though Wilson and Kelling only very briefly mentioned graffiti as one of these “symbols of disorder,” the lasting effects of their idea on the criminalization of graffiti culture and our urban landscapes, with the patch work of buff we often see, can still be felt today across the country. More recent research calls into question the legitimacy of the Broken Window Theory because of the lack of evidence supporting its validity; there is not a direct correlation between violent crimes and so-called quality of life crimes, such as graffiti. This broken windows and zero-tolerance reasoning is a common tool in cities to make a mostly harmless misdemeanor (like graffiti) into a felony. Zero-tolerance graffiti policing had its origins in New York City during the Giuliani administration and then eventually spread across the U.S. Zero-tolerance approach to graffiti abatement in Portland can be traced back to Hugh McDowell, the Office of Neighborhood Involvement’s (ONI) Graffiti Prevention Coordinator in 1998 (prior to Marcia Dennis taking the reins). 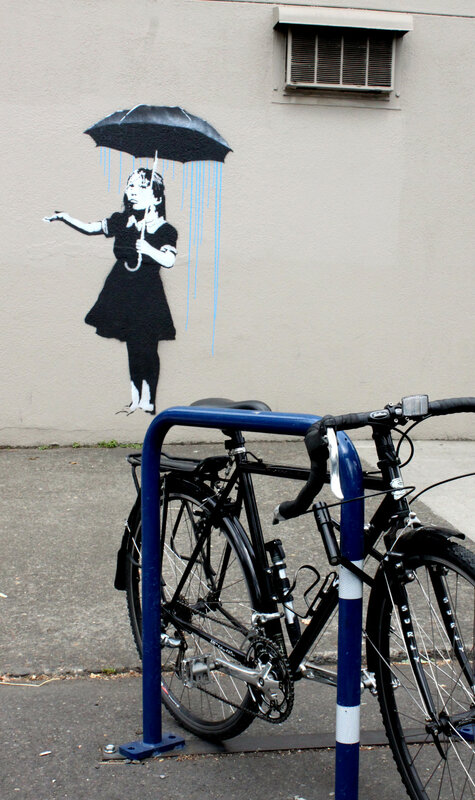 McDowell drafted a detailed “Anti-Graffiti Strategy” which outlined Portland’s new zero-tolerance approach to graffiti. The City even tried to implement a "graffiti free" zone in inner industrial SE Portland, but that intense effort of course failed. This attempt was infamously mocked by the classic Portland film The Subconscious Art of Graffiti Removal (2001). During this time, Portland’s graffiti abatement efforts became more formalized and Graffiti Abatement and Removal moved from a sub-category under “Crime Prevention” in ONI to a separate Service Level [program]. 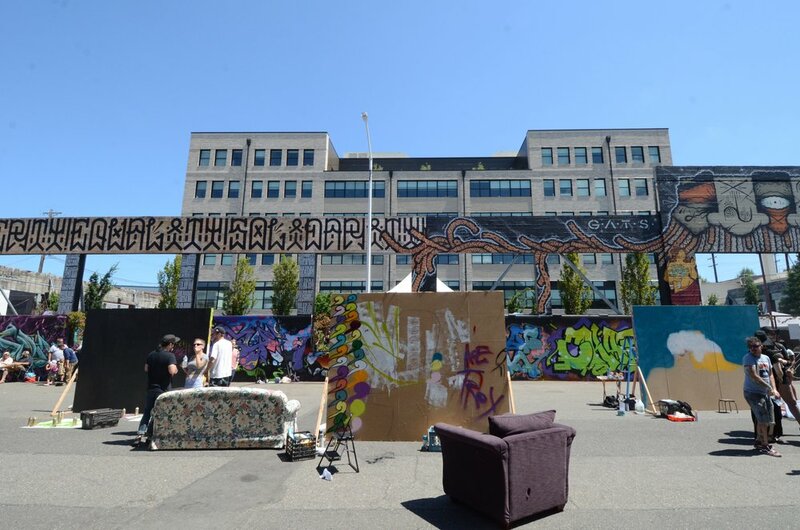 In 1998, the City of Portland also enacted the “Graffiti Nuisance Abatement Trust Fund” that helped gather city and business funding to support these increased graffiti abatement efforts. These funds went towards paying for the cost of graffiti removal, purchasing graffiti removal equipment and supplies, and for personnel to administer the new graffiti nuisance abatement ordinance. 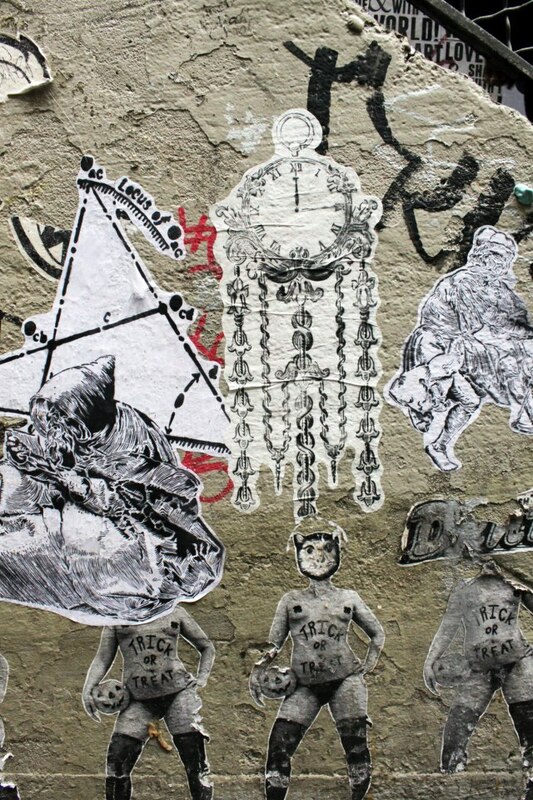 In 2007, an increased effort to crackdown on graffiti resulted in the City of Portland adopting a new policy regulating "Graffiti Materials and Sales.” This policy is now commonplace in most large U.S. cities. Under this policy, if a store sells spray paint, aerosol tips/nozzles, paint pens, glass cutting, or etching tools they are required to verify the photo ID from purchasers and keep a log of specific information on products sold, including the name of the purchaser, their driver’s license or ID number, and address. The store must also secure all graffiti materials to be inaccessible to purchasers without employee assistance (i.e., in a locked case, behind the checkout counter). Strangely, these types of laws act more as an annoying slight deterrent for two reasons. 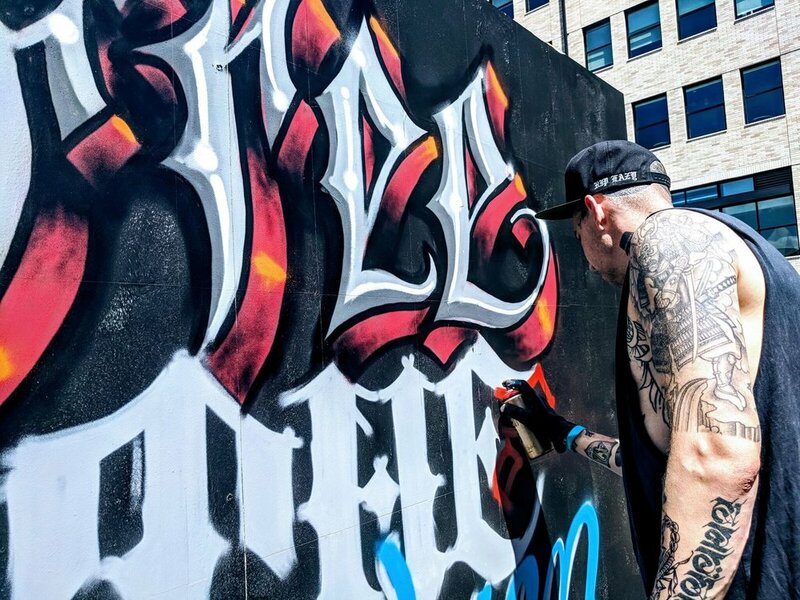 It is extremely unlikely and difficult (if not impossible) to prosecute someone, especially in a city, by connecting them to a graffiti crime with only spray paint purchasing evidence; graffiti artists need to be caught in the act or on camera. However, there are ways around these city ordinances. Today, companies like Montréal-based Bombing Science sell graffiti supplies worldwide online which only require a valid credit card. 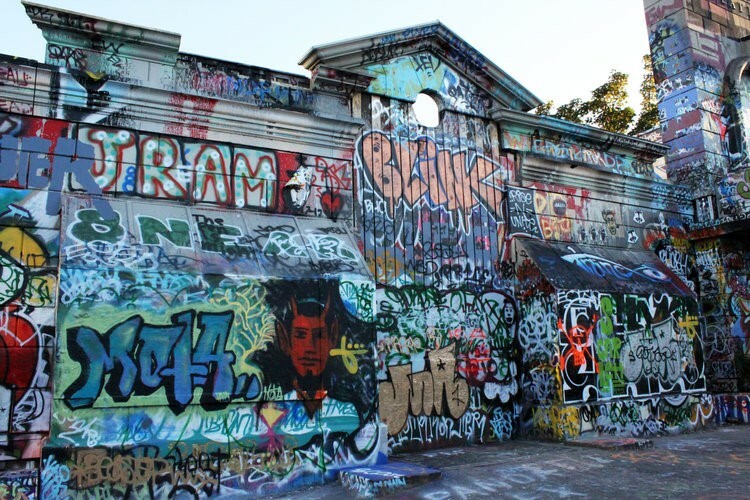 The City of Portland also regulates graffiti in its landscape with the controversial “Graffiti Nuisance Property Code,” requiring all graffiti to be removed within 10 days after being reported. Essentially, any graffiti or street art reported to the City that does not have a city-issued mural permit or waiver, is required to be removed even if it was done with permission or the property owner. If a building is labeled as a “graffiti nuisance property” and the illicit art does not get buffed within 10 days, the property owner will receive a fine. On top of paying for the City’s buffing, the property owner could face a fine of $250 for each abatement instance. If the owner refuses to let the City on the property, the City Graffiti Abatement team may request a judge to issue a warrant to access the private property to remove the graffiti. All it takes is one disgruntled or vigilante graffiti reporter for this cascade of events to happen. The City has no formal process for gauging the severity of the situation, the consensus of public opinion on the situation, or the possible community support for the art. For example, the ArtsBase controversy on Williams a few years ago. Additionally, all of this graffiti removal and abatement is done in the name of “public safety and health; however, this “broken windows” mindset only represents one way of thinking about graffiti and how it operates in our cities. PSAA receives countless inquires from people wanting to see the best of Portland graffiti. Cities across the world use their vibrant graffiti culture as an asset in their tourist marketing efforts. Street art and graffiti events worldwide bring huge crowds. Furthermore, it is often said by the community that harsh measures to regulate graffiti only result in a proliferation of vandalism-like tagging, and suppress more artistic ventures, and the indoctrination of youth into traditional graffiti culture (that is at least bound by codes and pillars of respect). We ask, whose public safety and health are these draconian graffiti removal efforts supporting? Surely not the people who actually live in these neighborhoods, who either choose to live there for their “gritty urban DIY feel,” and/or have much bigger safety and health concerns to grabble with (toxins in the earth and air, actual violent crime, rising cost of living, etc.). Cities across the country, including Portland, should reevaluate their priorities and focus on things that the vast majority of their populations are actually concerned about, and not spend precious tax dollars fighting an imaginary war on graffiti that will certainly never be won. No city in the history of human civilization has ever been “graffiti free,” nor will there ever be.